Since last week's post about 6-7 things to pre-empt 90% of Due Diligence was liked/shared/retweeted quite a bit, I'd like to follow up with some additional details on what exactly SaaS Series A/B investors will look for when you supply them with the data and material that I've mentioned. In my post I suggested that you should prepare a key metrics spreadsheet, a chart with your MRR movements, a cohort analysis, a financial plan, an analysis of your customer acquisition channels and, if you're selling to bigger customers, information about your sales pipeline and details about your largest customers. Let's go through these items one by one and try to anticipate some of the questions potential investors will think about. As a caveat, I'm going to mention some benchmark numbers but it's very important to note that none of these numbers can be viewed in isolation. There is not one number which will determine if investors want to invest. It's always about many puzzle pieces which together form a picture of the strength of your company. What's your visitor-to-signup conversion rate? Typically this metric is in the 1-5% range. If you're significantly below that, that doesn't have to be a red flag – there can be good reasons for a lower rate – but it may raise questions. What's your signup-to-paying conversion rate? In my experience, most good SaaS companies convert 5-20% of their trial signups into paying customers (but again, there can be exceptions). What's your lead velocity? Are you getting more and more new trials/leads every month? What's your account churn rate and more importantly your MRR churn rate? The best SaaS companies have an account churn rate of less than 1.5% per month and a negative MRR churn rate (which doesn't mean that you can't have a great company with somewhat higher churn or that you have to be at negative MRR churn at the time of your Series A/B). How fast and how consistently have you been growing MRR? Have you been adding an ever-increasing amount of net new MRR month over month? How has your ARPA developed? Have you been able to increase it? Are you able to sell annual plans? How long did it take you to get to $1M ARR? The best SaaS companies get there within 12-15 months after launch (but again, lots of exceptions ... there are companies that start slowly and skyrocket later). How much have you been spending on customer acquisition? As a rule of thumb, most SaaS companies should target a CAC payback time of 6-12 months, although in some cases there can be good reasons to spend significantly more. What are your CoGS and what's your Gross Profit Margin? As a pre Series A startup you're probably not great at tracking/attributing CoGS ... which I think is OK.
How much MRR have you been gaining by acquiring new customers? Have you been able to add MRR by expanding existing accounts as well? How much MRR have you been losing due to churn or downgrades? Mamoon Hamid of Social+Capital has coined the term "Quick Ratio" for the ratio between added MRR and lost MRR, and he's looking for companies with a Quick Ratio of > 4. If your Quick Ratio is significantly below that, is it trending in the right direction? How does your account and MRR retention look like for some of your older customer cohorts? Do you have low or even negative MRR churn? Taking a "vertical" look at the cohort analysis, are you getting better and better over time, i.e. do your younger cohorts look better than older ones? What's your estimated CLTV based on this cohort data? How does usage activity look like on a cohort basis? Is there a lot of "hidden churn" (customers who got inactive and are likely to cancel soon)? Is your plan both ambitious and realistic? Most investors are looking for T2D3 type growth, i.e. once you've reached around $1M in ARR you should try to grow 3x y/y for two years. Is your plan a coherent continuation of your historic/present numbers, both methodically and with respect to your key assumptions? Projecting a sudden, drastic improvement of your key drivers is understandably much harder to sell to investors. Are your key assumptions plausible, and what's the impact of somewhat more pessimistic assumptions? How did your customers find you? Organic, paid, both? Ideally you have strong organic growth (which is strong proof of product/market fit) as well as some success with paid customer acquisition channels (which can be scaled more easily). How does your conversion funnel look like for different sources of traffic? What are your costs per lead and per customer for different marketing channels? How close are you to building a (somewhat) predictable and repeatable sales and marketing machine? Do you have a sense for the scalability of your customer acquisition channels? How does your current pipeline look like? Do your short-term targets look realistic based on your "in closing" pipeline? Does your overall pipeline support your mid-term targets? How has your pipeline developed? Has it become stronger and stronger over time? Are you starting to get a handle on closing probabilities and closing timelines? In the original post I said as a bonus tip that if you're an enterprise SaaS company, you should put together some additional information about your largest customers. Here's another bonus tip: Include information about your NPS (which is hopefully very high) and how it has developed over time. Ideally, all these puzzle pieces together, along with the size and attractiveness of the opportunity you're going after and the strength of you and your team, will form the picture of a SaaS startup which has clear product/market fit, enthusiastic customers, strong initial traction, continuously improving metrics and which is on its way to building a repeatable, scalable and profitable customer acquisition engine. The founder of a portfolio company recently asked me what kind of numbers and other material he'll need when he goes into his next round of fundraising. He wanted to make sure that when he starts talking to new potential investors, he'll have answers ready to most of the questions he'll be asked. It saves you time because you'll have to answer fewer individual questions and requests in a piecemeal fashion. It can speed up the fundraising process dramatically if investors get almost everything they need at once (or almost immediately upon request). It makes you look better, because it shows that you're on top of things. Almost all of the numbers (good) investors ask for are things that you should be highly interested in anyway, since they are important for understanding and running your business. 1) A spreadsheet with your key metrics, since launch, on a monthly basis. It should include funnel metrics (visitors, signups, conversions etc.) as well as key financial metrics (MRR, CoGS, CACs etc.). If you haven't seen it yet, I put together a template for a KPI dashboard some time ago, which should serve as a good start. You are probably tracking most of these numbers already anyway, so you can use a copy of your internal dashboard, but make sure that it's clean, comprehensible and that you're using the right terms. If your dashboard contains any ambiguous metrics, add footnotes with precise definitions to make sure that an outsider understands exactly what he's looking at. 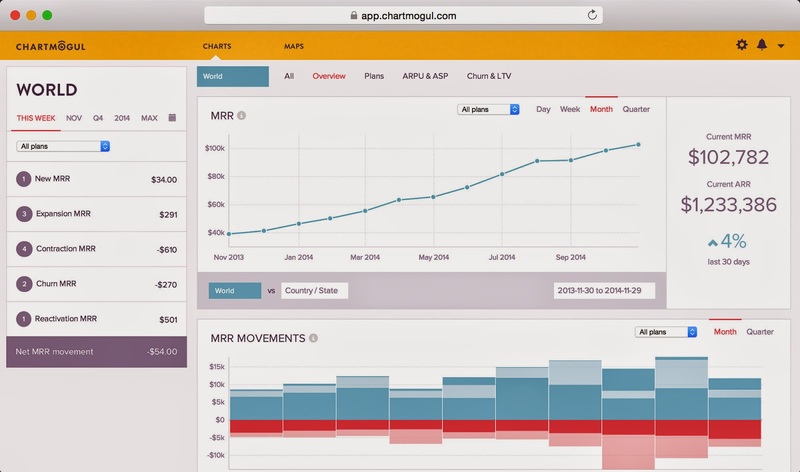 2) A chart with your MRR movements, since launch, on a monthly basis. That is, a chart that shows your new MRR, expansion MRR, contraction MRR, churn MRR and reactivation MRR for each month since launch. If you have a very wide range of customer size, consider breaking down the MRR movement analysis by your customer segments, because in that case the aggregate numbers across all customers may not tell the full story. So if you're selling to both SMBs and bigger enterprises, consider showing one MRR movement chart for the SMB customer segment and another one for the enterprise customer segment. Make sure to provide the raw data along with these charts (and any other charts you provide) to allow the viewer to do his or her own calculations. 3) A cohort analysis, showing each monthly customer cohort since launch and how the cohort’s MRR has developed over time. I created a template for that, too. If you're selling to both SMBs and enterprise customers, you should again consider doing a separate analysis for each of the two segments. Also consider adding a cohort analysis which is based on an activity metric. Think about what your key usage indicator is, then run a cohort analysis that shows the development of that number over time. 4) A financial plan for the next three years. The plan should follow the same logic as your historic KPI dashboard and should be relatively simple. Don't hard-code many numbers and make it easy to understand which assumptions the model is based on. Here are a few additional tips, and here's a template for a financial plan I built some time ago. 5) An overview of your customer acquisition channels. That is, a breakdown of your website visitors, leads and customers by source and data about your customer acquisition costs. Try to add some data points or estimates on the scalability of your customer acquisition channels. I know this is very hard and sometimes impossible, especially for inbound marketing driven companies, but some projections are probably better than having none at all. 6) If you're selling bigger deals, detailed information about your current sales pipeline. This should include a list of all qualified opportunities, and for each opportunity the potential deal size (in terms of MRR or ARR), pipeline stage and, if you have enough historic data to make a solid guess, closing probability and timeline. If you're a low-touch sales, high-velocity, low ARPA SaaS company you can leave this out. Bonus tip: If you're an enterprise SaaS company, put together some additional information about your largest customers. Think of it as a little case study, with some information about how the customer found you, how the sales process looked like and how the account has developed over time. What do you think? Does this capture most of the data Series A/B investors want to know?